Saturn's rings are wide but very thin. Astronomers using the Hubble Space Telescope captured this image of the rings edge-on in 1995. In a rare cosmic event, four of Saturn's many moons will cross the ringed planet's face Tuesday morning, each casting a shadow on the gas giant's surface. The event is not one that casual skywatchers will be able to see. But it will be photographable by seasoned amateur skywatchers through mid-sized backyard telescopes high-end camera setups, and the Hubble Space Telescope will photograph the event. Meanwhile, for the rest of us: Comet Lulin will be very near Saturn from Monday Night through Tuesday night, making the barely-visible fuzzball comet relatively easy to find. "Titan, Mimas, Dione and Enceladus will pass directly in front of Saturn and we'll see their silhouettes crossing Saturn's cloudtops -- all four at the same time." said Keith Noll of the Hubble Space Telescope Science Institute. Transits of this many of Saturn's moons are rare. "They only happen every 14 to 15 years when the orbits of Saturn's moons are nearly edge-on to Earth," Noll said. This will be the first time Hubble captures four moons crossing Saturn at once. The event begins on Tuesday, Feb. 24 at 10:54 UT (5:54 a.m. EST) when Titan's circular shadow falls across Saturn's cloudtops," according to a NASA statement. About 40 minutes later, the ruddy disk of Titan itself moves over the clouds. "Titan is so big, you can see it just by looking through the eyepiece of a small telescope -- no special camera is required," said astrophotographer Christopher Go of the Philippines. One by one, the smaller moons Mimas, Dione and Enceladus will follow Titan. At 14:24 UT, all four satellites and their shadows will simultaneously dot Saturn's disk. Spotting these moons is not something the average person with a small telescope can do, however. "To photograph the smaller moons, you'll need a mid-sized backyard telescope equipped with a good CCD camera," Go said in the NASA statement. "The transit of Titan will be of particular interest," Noll said. "Researchers plan to use Saturn as a backlight to probe the size and transparency of the giant moon's atmosphere." 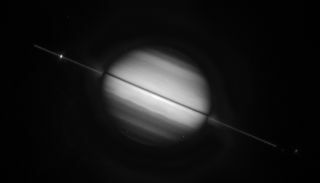 While Saturn's rings are most dramatic when tilted significantly from our point-of-view, this week Hubble will capture a rare view of the rings almost edge-on, a point of view that can reveal ring-warps, undiscovered satellites, and new information about the reflectivity of ring particles.